Laguna Hills bee removal services by The Bee Man are done quickly, professionally and effectively. Bee infestations are frightening. So, our first priority is the safety of you and your loved ones. If you see unusual bee activity, please follow our bee safety tips and call us. Do not attempt to remove bees yourself. A bee’s flight pattern reveals a lot about the level of possible bee infestation. 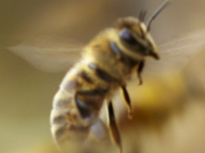 Bees usually have 2 distinct flight patterns. It may take a few moments to observe the flight pattern but doing so may provide valuable information about what to do next. If bees are flying around aimlessly, looking for something, most likely there is no hive. This is good because the bees are probably either feeding and collecting pollen. They will most likely return to a nearby hive. As a result, bees without a hive are not territorial and will not attack because there is no hive to defend. In contrast, if bees are darting in and out of a specific location (usually a small hole about 1/8 to 1/4 inch big), there may be a hive. If an infestation is present, do not attempt to disturb the bee activity because they will defend their hive. If the bees are of the Africanized honeybee variety, then take extreme caution. These bees will defend the hive very aggressively. They can send out thousands of bees to defend their nest. These bees are also known as “killer bees” and can kill small animals and seriously injure people. The Bee Man offers professional bee removal services to residents and commercial customers 24/7. Although very docile, we advise not disturbing the bees while they are clustered together. Please refer to our safety tips here. Finally, if you need any Laguna Hills bee removal, please contact The Bee Man at (949) 455-0123 before any property damage occurs.